Avp-Audio Visual Presenter is a ground breaking real time player, editor and recorder with a radically simplified interface. The historic baggage of time lines, sliders input boxes etc. has been replaced with a gesture based interaction. This allows in particular young people to edit and record with great ease and fluency. It is a memory efficient software. AVP runs on Microsoft Windows 95, 98, ME, 2000 and XP as well as on Mac OSX. 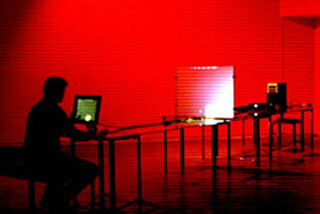 Internationally, it was first presented in April 2002 as part of Forum IRCAM, Paris.